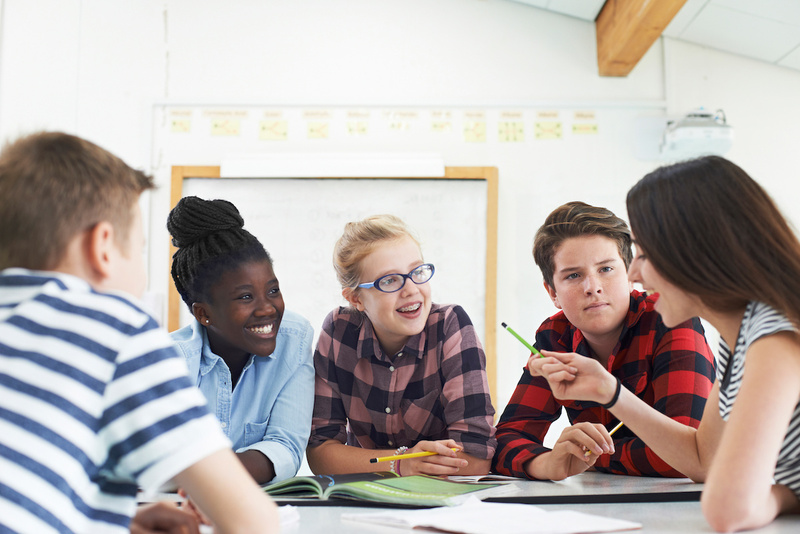 Making new friends in middle school can be especially challenging for students who struggle with social interaction or behavioral issues. For instance, students with social anxiety or attention deficit hyperactivity disorder (ADHD) may find it difficult to find a group of friends to sit and talk to during lunchtime. But you can help students learn to make friends in middle school by practicing friendship development skills by role-playing conversations. Teach your child how to build on conversations and how to ask probing questions. Get your child involved in clubs where he can meet people who share his same interests to make it easier to have conversations. Also, consider getting professional help, such as signing your child up for a social skills group. Middle school often requires students to change classes throughout the day. While keeping up with the bell schedule and location of the classrooms is challenging for any student new to middle school or the process, it can be especially challenging for students who have learning disabilities, behavioral issues or social challenges. For instance, students with behavioral issues may easily get frustrated and upset when they can’t find the class or get confused as to which class to attend after their first class. Help your child overcome these issues by preparing them with a school map. Note the location of the classes on the map and go over the class schedule. You can even visit the school when it’s less busy, such as after school, and have your child practice by showing you the classes they should attend for each period. Without adequate executive function skills, it can be challenging for your child to be successful academically, behaviorally and socially due to an inability to plan, focus and multi-task. For instance, students with Asperger's (ASD) who lack sufficient executive function skills may struggle with quickly creating an outline for an essay while most of the class is finishing up the essay assignment. You can help your child overcome these issues by teaching her self-advocacy, including asking for accommodations, such as specific seating arrangements to better focus without distractions. Also, consider teaching her how to use a planner and other organizational tools. Whether it’s making friends or changing classrooms, some of the most common middle school struggles are challenging for students with learning disabilities. By applying effective strategies to overcome these challenges, you can set your child up for success in middle school. Brain Balance has worked with over 25,000 children and their families and we know we can help yours, too. Contact us to learn more about our program!